Have a Fukushima Question for My Dad, A Nuclear Engineer? Over the past day or so, I have been receiving some requests to interview my dad, a nuclear engineer, about the Fukushima Daiichi Nuclear Power Plant Disaster, which has been in the news again recently because of high radiation readings. I’ve been trying to coax my dad into doing an update interview about Fukushima for the past month or so, but his work and travel schedule (as well as my own work and travel schedule) have made it difficult for us to carry out an update interview. We’ve both been extremely busy. However, we are finally planning an update interview. We plan to carry out the interview in the next week or so. My dad is going to do some research over the next few days. In the interview he will give a general update on what progress has been made– and hasn’t been made– at Fukushima over the past five months. He will also answer 10-12 questions. I have a couple of questions of my own, and I have also received some questions by email. If you have a question about Fukushima that you would like to ask my dad, a nuclear engineer, please post a comment below or send me an email (georneys blog at gmail). For those of you who are not familiar, for the first month of the Fukushima disaster I interviewed my father 20 times about the ongoing crisis. You can find the interviews here on my vimeo channel. You can find all of the posts under the category “Interviews with my Dad a Nuclear Engineer.” For some reason, all of the embedded vimeo videos disappeared during the move to AGU, but I’m hoping this will be fixed in the near future. If you want to listen to the interviews, please visit the vimeo page. If you’d like to ask my dad a question about Fuksuhima, please send in your question as soon as possible so that I can compile the questions. As for the book of all the interviews… it is still in progress. My PhD work takes priority, but I continue to work on it as time permits. Sorry for the delay! Not a question, but a link: make sure your dad sees this one. Record-high radiation levels of more than 10 sieverts (10,000 millisieverts) per hour have been detected on a pipe at the crippled Fukushima No. 1 nuclear power plant, according to Tokyo Electric Power Co. Honestly, I’m thinking high pressure steam AND possibly early on, liquid flow following that pipe. As I recall, the pipeworks are NOT foolishly FIRMLY in concrete, but have a pipe that they pass through. That way, a replacement pipe can be pushed through. THAT said, I REALLY want to see a radioisotope sample of that hot spot, THAT will tell the tale. Is it a residue of an engineer’s profanity? Or is it corium pushed under pressure into that remote location in small particulate form or is it something else entirely? With that “record high radiation level” (which by itself is meaningless) in the news it might be a good opportunity for your Dad to talk a bit about contamination vs. exposure, and how the Inverse Square Law works. And perhaps a primer on different source term isotopes- some of which are of minimal risk and others of serious concern. Thanks for the interviews. A few questions about radiation doses and medical consequences. Readings in Fukushima City and Koriyama have been around 0.5 – 1usv/hr how will these low dose rates effect health? Also some areas in the mountains of Fukushima within the 30km zone are 7.5 usv/hr. What would the risk be to people still living in the area? I’d like a comment about Tepco going off of their SOP book during the emergency. I’m WELL acquainted with going off SOP during an emergency where SOP book wouldn’t work. But, THIS appears to be an abandonment of ALL procedures, which may have increased the scope of the disaster by a moderate amount. I’m not asking to judge, but a feel for the situation and similar SOP books and the decision processes, of which I’m not familiar with. What is his personal feel for the decisions and actions, placing himself in their shoes, with the knowledge available at the time? On first, second, awww, 77th blush, I’m thinking a GREAT design. It withstood FAR worse than all naysayers predictions, yet corium is only in the containment vessel. I’m really thinking flashover of overheated rods in the storage pools generating the fissionables around the immediate plant grounds, when the pools began to run dry or close to dry. The measured amounts match a napkin calculation and I no longer have classified networks to access for the more precise calculations… The downside of retiring. Think you could get those questions addressed in brief? Preferably after an hour or three of chewing on them. They’re rather hard and uncomfortable questions for a nuclear engineer, the most cautious creature on the planet. But, honest, well thought out answers would rather put a large Mark 48 into the midsection of the conspiracy theorists. Can we get his thoughts on thorium reactors and “elimination” of nuclear waste too, in an afterward? And a general discussion of the merits of the generation 3+ systems over the current relics in operation? Hi Steve– I’ll see how many of these questions my dad can answer. In our very last interview (#20, see the vimeo page) my dad talked in detail about thorium reactors and later generation nuclear power plants. I’m aspiring to becoming an Electrical Engineer and was wondering if it is possible to make nuclear waste cooling ponds as “safe” as the reactors. What I mean is that if there is a catastrophic loss of cooling you don’t have a run-away reaction, that could expose the fuel rods to air. As I understand the reactors did experience core meltdown, but at least the containment structure held up. There wasn’t a reaction in the fuel storage pools at all, they’re designed to prevent any chain reaction. That said, the spent fuel DOES generate quite a bit of heat for an extended time, losing coolant flow then permitted the heat to build, causing the water to evaporate. THAT is what happened at Fukushima, the fuel rods then overheated and the cladding of the rods oxidized. Other than that slight error in your question, it is an excellent question. For generation 3+ reactors, passive cooling is part of their design in an emergency. IS such a design possible or feasible for the fuel storage pools? Perhaps a gravity assisted convection current driven coolant loop? Assuming they don’t just dump it into the sea, how do they go about treating all that radioactive water? Can you just use standard water purification techniques (filtration, ion exchange, reverse osmosis, distilation) or does that leave your purification equipment too radioactive to deal with? They’re actually filtering the water now, storing the treated water and releasing it back into the damaged reactors. I’m uncertain WHICH filtering technique they’re using for that volume of water, but it’s been ongoing for over a month. There were a few stoppages, due to leaks in the system that needed to be repaired, but it’s back online now. From all of the documentation I’ve reviewed, there is little, if any, fissionable elements in suspension in the water. It’s been primarily iodine-131 and cesium-137 (and assorted other daughter products from fission reactions from when the reactor was online), of the greatest interest is the cesium-137, as the iodine-131 was created sufficiently long ago that it’s past several half-lives and is only present in trace quantities now. That will remain in the filter media and will need to be safely stored as waste. The up side of cesium-137 is that its half-life is quite short, compared to fissionables, such as uranium and plutonium. I recall there was quite a bit of research in the 1950’s and 1960’s on soil treatment, as part of the cold war, where soil was to be processed to remove fallout. Is there a technique to remove the cesium-137 from the arable land’s soil that won’t significantly degrade the fertility of the soil? There’s quite a lot of land now with moderate to heavy contamination of cesium-137, quite a bit of it was farmland. If that contaminant could be processed out of the soil, the area could become arable farmland again, towns and cities could also become habitable again, after soil treatment and chemical binding for dust that contains cesium-137. Chemically binding cesium of any isotope isn’t even very tricky, but doing that in soil would be a great boon to the people of Japan. I just can’t remember what the status was of those projects and if they ever came into fruition. Ooh, that’s a good question. A sound solution to the cesium-137 contamination problem I’d guess would have a dramatic impact in mitigating the most serious effects of the long-term aftermath of the disaster. I think of the Chernobyl exclusion zone. It’s just about normally habitable again. Plenty of flora/fauna/and humanity is back in there. Except, cesium-137 is still a rather significant contaminant. So, it’s pretty safe to live or work inside the zone, but you’re admonished from consuming local produce or eating foods derived from livestock raised in the zone. I think this problem is not yet solved. One REALLY big difference between Chernobyl and JAPAN in general is that the region around Chernobyl COULD be evacuated. On CANNOT evacuate 1/3 of Japan! So, it comes down to getting the mess totally under control and 100% contained, then clean-up. Something that requires ingenuity, diligence and hard work. Something that is no stranger to the Japanese people. My question is a quick one: What do you think of this article that claims Fukushima is worse than Chernobyl? My gut reaction is that all the people quoted seem to be pretty strongly biased, so I’m not sure how much to trust the article. It’s worse and better at once. 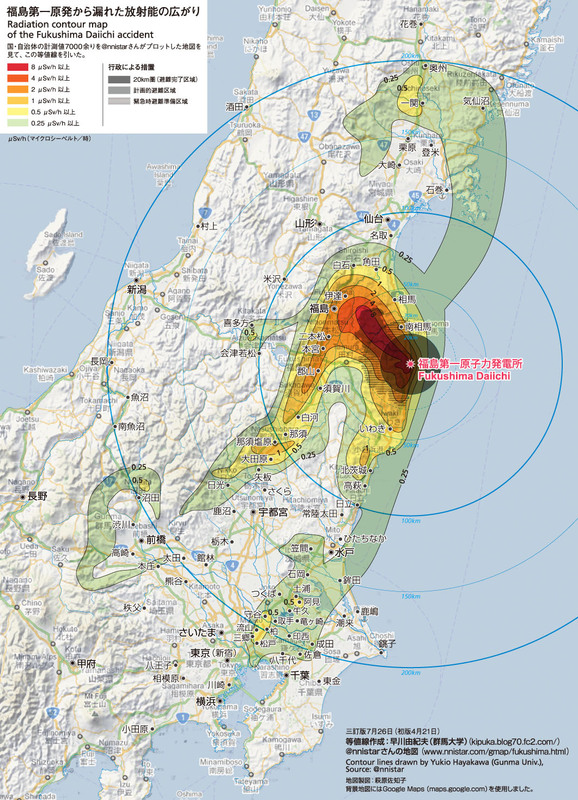 It’s worse in, Japan can’t evacuate 1/3 of the country. The Russians COULD evacuate the Chernobyl region and leave it empty. It’s better, as Japan DOES have the capacity, workforce, professionals and capability to clean up the worst of the offenders, isotope wise, cesium-137. The godsend in this is, cesium is EXTREMELY reactive. Hence, with some modest creative chemistry, one can react that element chemically and bind it strongly, thereby extracting it from soil. Or dust from the environment. Hence, easy. Not in labor or expense, but in technical ease. MY read of the story, after skimming it, which I’m rather good at, is it is ENTIRELY biased heavily. A key difference between Chernobyl and Fukushima is, FISSIONABLE MATERIAL did NOT escape into the environment at large, at Fukushima, it is ALL around the reactor buildings ONLY. In Chernobyl, it burned, along with the graphite rods and was atomized to the winds. I still remember some footage that made me chuckle, yet recoil. When a scientist went into the exclusion zone around Chernobyl and was studying the environment, which was still QUITE hot, radioactively speaking. He managed to corral a field mouse and pick it up. He was making remarks about the survival of the mouse when he placed the radiation monitor next to the mouse and it went WAY up, dangerously high up. He dropped the mouse in the most unprofessional way and jumped back. As *I* would have done. And I KNOW that he HAD to have soiled his pants. The field mouse had residual radiation levels that the “book” tells us is short term lethal. But then, the mouse has a rapid reproduction rate and short life expectancy in the wild. And a few rueful memories in a different field of endeavor and similar results. After reading the book, “TMI: 25 Years Later,” I came away with the impression that TMI, despite its core suffering a partial meltdown, did not release altogether much radioactivity. The radioactivity that was released also seemed to make a minimal environmental impact. However, at Fukushima, accounting for the fact that more reactors and also spent fuel pools were involved, I have the impression that more radioactivity has been released (i.e. more than say, four TMI’s worth), and that of the total radioactivity released, a larger proportion of the isotopes have been ones typically more threatening to the environment and human health, like cesium-137 (which I think wasn’t released in any significant quantity at all from TMI). Are these impressions correct? And if so, what might this imply for reactor designs (in this respect are PWRs inherently safer than BWRs)? How might that affect considerations for reactor disasters where control of a unit is lost for a period long enough to melt fuel? In that scenario, does a BWR represent a greater environmental risk than another type? I seem to recall a study showing cesium-137 in deer tongues in the surrounding area, but not a great deal of it (testing of harvested, hunted deer in the region). I rather paid close attention to TMI, as I was in high school when it melted partially. Meanwhile, Fukushima at THREE FULL MELTDOWNS *AND* reactor pool burning. At first blush, you’d wonder how they could have dealt with the problem worse, but they could NOT just walk UP to the reactors and pipes and look, conditions prohibited it (as in, one way trip, even WITHOUT a meltdown and no report back). To be honest, I’d say somewhere between 8-10 TMI releases, in the worst possible way, in a realistic sense. From an engineering standpoint, PWR reactors have higher pressures than BWR reactors, hence more can POTENTIALLY go wrong, but it’s not a new field, with many unknowns. Reactors at heart, are reactors. The small temperature difference between a higher pressure PWR and lower pressure BWR are not that significant, compared to the melting point of the metals involved. For, at the end of the day, there are three forms of lost control that can result in a melted reactor. A prompt critical event is pretty much impossible in the US and most of the world, due to design. The unit would blow apart and not remain potentially critical, IF such a geometry were possible. LOCA (Loss Of Coolant Accident), think Fukushima and TMI. TMI didn’t FULLY melt because of a mental fixation of the crew and a shift change, with fresh, untired minds. I’ve worked in highly technical fields my entire adult life. I’m intimately familiar with target fixation. I’ve also learned how to take that “mental breathe”, mentally step back and clear conceptions and re-approach a problem. I’m QUITE successful at it. YET, I STILL get caught in it, on occasions. WITH over 30 years of experience in several highly technical fields, of which I’m a subject matter expert on.